The world is full of sin: unapologetic, wayward sin. As Christians who have experienced the morning of sin in our hearts, the repentance of sin in our self, and the ongoing process of finding and removing sin in our lives, we can easily forget that the sin in the world hasn’t met it’s Maker yet. The people are in a range of states that goes from never having experienced God to fully aware and choosing to reject His voice. 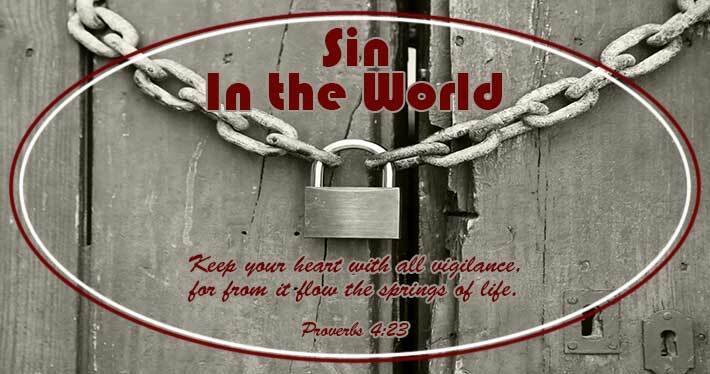 Apostle Paul reminds us in 1 Corinthians 5 about how to handle sin in the world. He’s dealing with a sin issue in the church at Corinth and he’s talking about how to address it within the body. First, he reminds them of this, “I wrote to you in my letter not to associate with sexually immoral people– not at all meaning the sexually immoral of this world, or the greedy and swindlers, or idolaters, since then you would need to go out of the world.” (1 Corinthians 5:9-10). In other words, the world is bad and you can’t get away from it. He goes on later to say, “For what have I to do with judging outsiders? Is it not those inside the church whom you are to judge? God judges those outside.” Our job is to reach out the fallen and lost and offer them an example of the beauty of salvation through Christ. We can’t judge them for living in sin when they are under full sway of the law of death, as Paul talks about in Romans 6:20. Sin is harmful, both to the ones doing it and everyone around them. There are times in our lives when we set boundaries for ourselves and our families to keep the harmful effects of sin away. For example, we may limit the movies we see or the music we listen to. Setting protective boundaries is different that judging the world and trying to make everyone look and act like you even if they don’t claim Jesus as their Savior. We know that sin will be defeated by God in the end. The Bible says that all will bow and confess that Jesus is the Lord, but we don’t know when. Until then, we wait patiently as the sin around us ripens and prepares for the judgement that the Lord will bring on it. The first way that we need to face sin is in ourselves. It can be in our hearts and focus and it can cause us to bring distraction to our relationship with God and harm to our relationships with others. It’s bad news and it has to be dealt with. Jesus gives us the intensity of how we should be dealing with it in Matthew 18 “And if your hand or your foot causes you to sin, cut it off and throw it away. It is better for you to enter life crippled or lame than with two hands or two feet to be thrown into the eternal fire.” (v. 18). Personally, I don’t read this as an invitation to self-harm, although there have been many in history that have used this verse that way, unfortunately. Instead, it’s setting a passion level that shows full commitment to obedience to the Lord and His commands. Proverbs tells us that we should watch our heart because the flow of our life, the springs of our life come out of that source. If we are seeing sin in our choices, words, or actions, we need to stop and see where in our heart the issue is coming from. When you see something is wrong, are you willing to give it up no matter how much it hurts? This is the question we have to ask in order to be able to deal with sin our own heart. This idea is root of the message that Jesus gives in Matthew 7:3-5, “Why do you see the speck that is in your brother’s eye, but do not notice the log that is in your own eye? Or how can you say to your brother, ‘Let me take the speck out of your eye,’ when there is the log in your own eye? You hypocrite, first take the log out of your own eye, and then you will see clearly to take the speck out of your brother’s eye.” We can’t see clearly how to help and love others if we’re not honest and passionate about dealing with sin in ourselves. 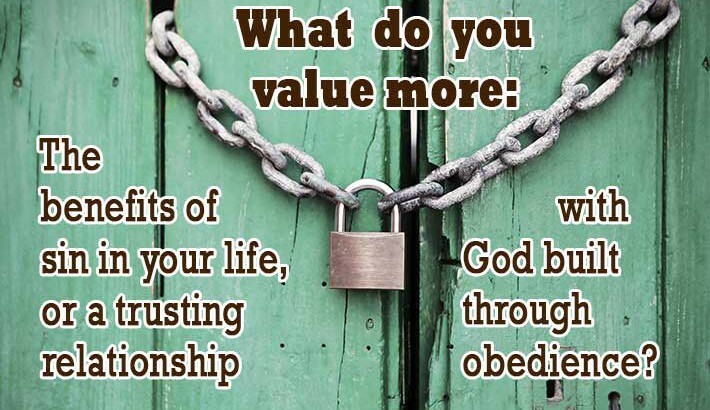 God wants us to be committed to Him and to choose to obey His commandments. After all, our salvation is a free gift; our response to that gift is to live in such a way that we show our belief in Him and our love for Him and each other. How we responds to the sin that’s revealed in our life shows where our hearts truly are. Are we committed to Him that we will remove sin no matter the cost? Are we willing to stop judging others and look at ourselves only when we talk about living right? I am truly and fully convinced that all the pleasures and gain that we sacrifice in this life will be worth it when we meet Christ. In addition, removing our sin is often form of protection for this life as well. Double bonus! If this is an area that you find yourself lethargic about, consider praying that God will give you a love of living only for Him and the strength to face whatever needs to be removed in your life.